The APEC Economic Leaders’ Meeting in Yokohama City is coming in two months. 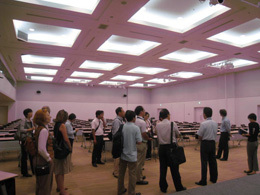 Yokohama presented a half-day tour in advance of the APEC following a series of tours in July. As a future growth strategy, Yokohama focuses efforts in the environmental field. Nineteen correspondents from sixteen media organizations from China, Taiwan, Vietnam, Germany, France, and the UK joined the tour and covered the international convention center which will be the venue of the APEC, as well as the “environmental model city YOKOHAMA”. The Conference Center of PACIFICO Yokohama, the expected venue for both the APEC Ministerial Meeting and the Economic Leaders’ Meeting in November, was renovated back in March and became more responsive to the environmentally-friendly. The participant journalists had a briefing on PACIFICO Yokohama after a greeting from Mr. Takashi Kobori, President of PACIFICO Yokohama. Then they took a tour of the facility and covered the Conference Center and the Exhibition Hall where preparations for the APEC are going on. After the facility tour, the participants met with Mayor Fumiko Hayashi. Mayor Hayashi talked about the preparations for the APEC. Taking the opportunity of holding APEC, she told of her enthusiasm for promoting sightseeing and attracting business enterprises to Yokohama that made use of its geographical advantage. During the question-and-answer session, there were various questions from the journalists on the financial burden of holding APEC for the city, promotion of the city, and its autonomy as a provincial city. At the briefing on the “Yokohama Smart City Project (YSCP)” in the Conference Center, the journalists learned about management systems using smart grid-related technologies at Minato Mirai 21 district and covered new environmental measures of Yokohama City. During the APEC, Yokohama City will introduce YSCP to the world by demonstrating smart grid-related technologies. The journalists also visited Yokohama Home Collection (house exhibition space) and experienced advanced living standards in a three-story mockup house and had a briefing on introducing renewable energy into the home using a photovoltaic power system, and also an electric vehicles (EV). The journalists visited Nissan Global Headquarters at the end and they were introduced to the characteristics and promotion of the zero-emission car “LEAF” that emits no CO2 while driving. 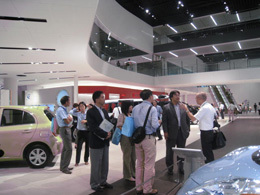 In the Gallery, the journalists were eagerly photographing the exhibition of Nissan vehicles including the LEAF design model.